Riva Luting Plus is a resin modified, self curing, glass ionomer luting cement, designed for final cementation of metal, PFM and resin crowns, bridges, inlays and onlays plus ceramic inlays and crowns. 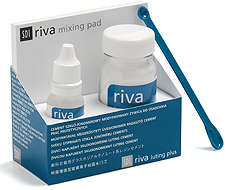 Riva Luting Plus chemically bonds to dentin, enamel and all types of core material. One simple colour Riva Luting Plus is available in a universal light yellow shade.